Emily: You know, I actually remember you better than I remember my mum. Death: Really? I don’t remember you at all. Emily: Really? My mum died of lung cancer. I was four, and blonde. Death: And I told you the house metaphor. Death: Sadly, still no luck. Emily: Do you honestly talk to that many kids? 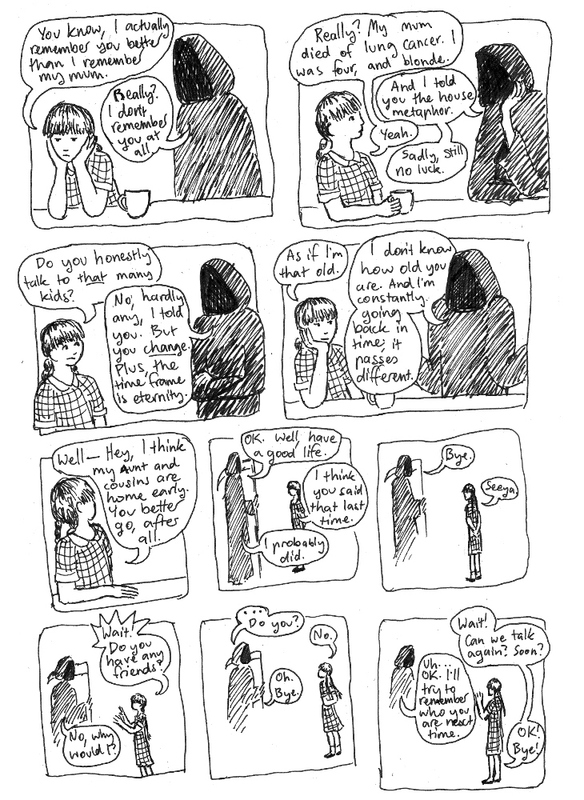 Death: No, hardly any, I told you. But you change. Plus, the time frame is eternity. Emily: As if I’m that old. Death: I don’t know how old you are. And I’m constantly going back in time, it passes different. Emily: Well – hey, my aunt and cousins are home early. You better go, after all. Death: Ok. Well, have a good life. Emily: I think you said that last time. Death: I probably did. Bye. Emily: Seeya. Wait! Do you have any friends? Death: No, why would I? ... Do you? Emily: Wait! Can we talk again? Soon? Death: Uh... ok. I’ll try to remember who you are next time.